Stunning handmade sterling silver shamrock pendant set with Connemara marble hearts. 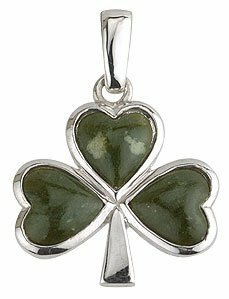 Beautiful Connemara marble hearts are set into this elegant sterling silver shamrock pendant. Measuring 17mm wide and 22mm high and fitted with an 18 inch sterling silver chain this necklace is handmade in Ireland and hallmarked at the Irish Assay Office In Dublin Castle. As the name suggests, this beautiful stone originates from ancient quarries to be found in the area of Connemara in County Galway. Celebrated for its forty shades of green, Connemara marble evokes the rich textures of the Irish countryside. Traded and treasured for millennia, real Connemara marble, with its unique dark green veins, adds a rich decoration to any Celtic jewelry.